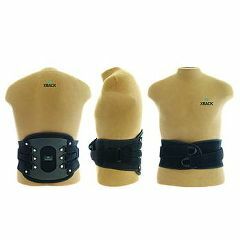 AllegroMedical.com offers The The XBACK LS Back Brace. Learn how the LS can stop lower back pain. The XBack LS [Lower Spine] is a one piece LSO brace that provides coverage and support from the sacrum through the L1 vertebrae. The unique, easy to put on and adjust strapping system makes this brace not only comfortable to wear but it won't ride up while sitting or driving. The LS weighs only 16 ounces and will fit under most clothing. The LS was designed by an orthopedic physician to provide relief from lower back pain and support for healing. The compression straps work with the rigid anterior panels to provide a hydrostatic "lift" that helps take the weight of the abdomen off the lower spine which in turn helps to decompress the vertebrae thus providing a more consistent relief for low back pain. Because the compression straps are anchored directly to the pre-shaped posterior panel, as you pull on the adjustable closure straps the posterior panel will further mold to the back providing rigid support while restricting motion and controlling pelvic tilt to aid healing of the back. What are the key benefits of the LS? The LS provides coverage from the sacral spine through the L1 vertebrae. The lightweight brace - only 16 ounces - is made of single layers of breathable, moisture wicking materials for cool comfort - especially if wearing in warm climates or for prolonged periods. The rigid anterior panels and the unique compression strapping system provide a hydrostatic "lift" that helps take the weight of the abdomen off the lower spine which in turn helps to decompress the vertebrae thus providing a more consistent relief for low back pain. The pre-shaped anatomical curve of the posterior panel contours to your back and the indentations in the hip and thigh areas keep the brace from "riding up" as you move, sit or drive; a huge problem with conventional bracing. The center cutout in the posterior panel makes the brace lighter and cooler and removes direct pressure on the spine itself. Who should wear the LS? Individuals with bulging or herniated discs, mild scoliosis, etc. Why is the XBACK LS unique? High quality material. Made in the USA. ￼The LS is much thinner and lighter than conventional rigid braces and far more effective than wraps or elastic braces which cannot provide "motion limiting" support for the lower back. Many conventional braces rely on heavy, bulky, complex strapping or pulley systems which make centering and adjusting the brace difficult and make them hot and very uncomfortable to wear, especially when sitting or driving. The LS unique compression strapping system is anchored directly to the thin pre-shaped posterior panel so as the wearer pulls on the straps, the panel further "molds" to your specific back shape. The posterior panel restricts motion and controls pelvic tilt and rotation thus stabilizing the spine. Unlike other braces the anterior panels provide the hydrostatic lift to help decompress the spine. The LS is cool, lightweight firm support for anyone suffering from muscular or disc related low back pain or for the prevention of pain caused by activity or posture that puts stress and strain on the lower back. When and where is the LS worn? The LS is easy to put on, adjust, and remove so it can be worn for short periods or just for specific activities or all day, especially for prolonged sitting or standing to prevent unwanted movement that can aggravate the body's natural healing process. At a mere 16 ounces and with its thin design, the LS can easily be worn all day and will actually fit under most clothing.